Besides the bride and groom, the wedding party is a very important part of the day. They are usually family or close friends you want to be a part of the wedding. Taking bridal party photos can be a challenge depending on how many people are in the party and the location for the pictures. Jennifer and Anthony had a large wedding party, but at a great venue. They had their wedding, photos, and reception at the Tonawanda Castle in Tonawanda NY! This is a gorgeous location for photos. There are different rooms everywhere. The bonus is when you book your wedding at the Castle, you pretty much get the whole building. This room is up on the third floor. It has giant windows for amazing lighting. After moving around some furniture, then bringing some back in, the wedding party was posed. This reminds me of an old time style portrait with people standing and sitting. 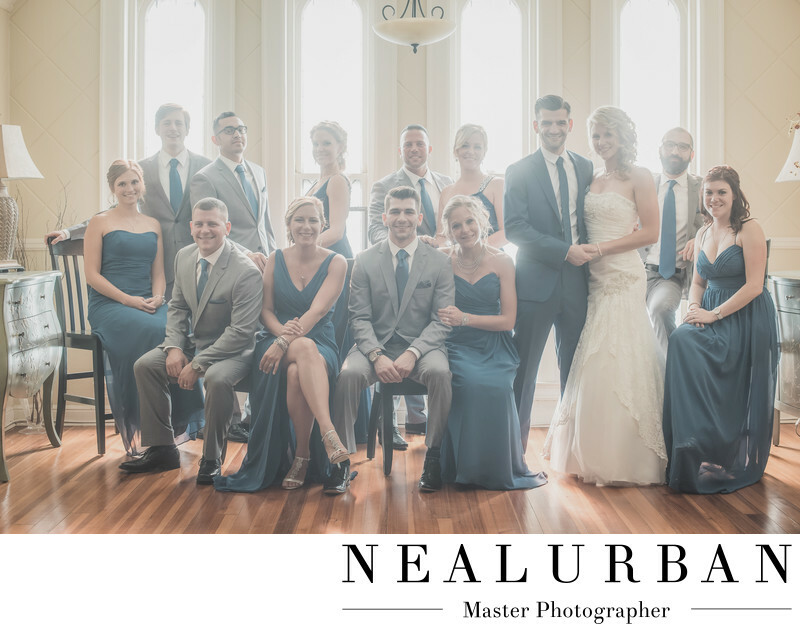 You will notice the bride and groom are not directly in the center of their wedding party. This is because it looked funny with the light in the middle of the ceiling. So, they needed to be offset, which still worked out great. I even like the dressers and lamps that are on each side of the room. It would look too empty if those were taken out. The bridesmaids dresses were such a pretty color. They worked so well in this room. The light from the windows toned down the brightness just a tad and went with the feel of the photo. We try to have fun with the bridal party. We want everyone to have a good time and not dread taking photos. We are all there to please the bride and groom and make their wedding day as memorable as possible! Location: 69 Delaware St, Tonawanda, NY 14150.